The Elecjet manufacturer launches the first external battery that uses graphene with the traditional Lithium-Ion and offers a much faster charge than the competition. Does graphene represent the future of batteries? This is what many scientists and manufacturers, including Samsung, are doing research to improve the Lithium-Ion and Lithium-Ion Polymer technologies currently used. The advantage of using graphene, a material consisting of carbon atoms, is here to allow ultra-fast charging, without the battery heats up or wears out too quickly. The Elecjet manufacturer decided to take up the challenge with Apollo, the first external USB battery using graphene in the form of composite materials. These materials serve as coatings for the two electrodes of the battery. With a capacity of 6000 mAh, this battery recharges completely in just 20 minutes depending on the manufacturer, against 3 to 5 hours for most competing models. 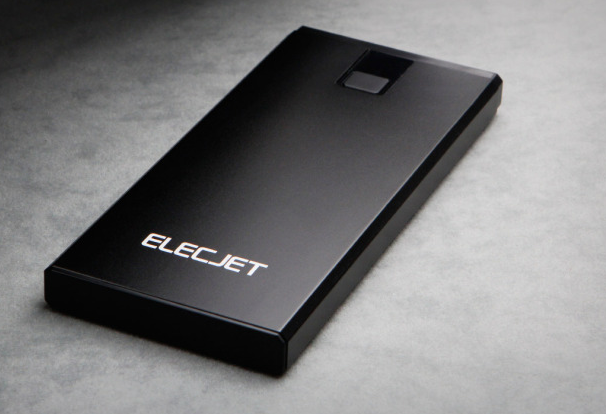 After successful financing on the Kickstarter platform, Elecjet is planning a delivery for the month of March. We received a preliminary version of the battery to see if the promise of fast charge is held. With a weight of 236 g and reasonable dimensions, the battery is easily transported in a bag. It is equipped with an LED display that indicates its charge level as well as a button to trigger the charge of a smartphone, in case the automatic triggering is not done. The manufacturer has provided three USB ports to meet all scenarios. The USB Type-C port is used to charge the battery (the cable is included), but also to charge a device with a compatible port. Compatible with the Power Delivery standard, it accepts a current of 3 A, a voltage of 5 to 20 V and a maximum power of 60 W. At the output, it delivers a maximum power of 40 W with the choice between four combinations voltage / intensity : 5 V / 3 A, 9 V / 3 A, 14.5 V / 2.5 A and 20 V / 2 A. It is the device to be loaded that automatically determines which combination to choose with the Power Delivery standard. The white USB port is similar to that of conventional USB chargers and offers a voltage of 5 V and a maximum intensity of 2.4 A. What to charge most smartphones, even some tablets. The orange USB port complies with the Qualcomm Quick Charge standard, here in version 3.0. This fast charging standard is used by many smartphones that ship Qualcomm processors, such as the latest Samsung Galaxy and Sony Xperia. We first tested the charge of the external battery. For this, Elecjet provided us with a USB Type-C 60 W charger, compliant with the Power Delivery standard. Starting from 0, it took only 15 minutes to reach 50% and 20 minutes for 75%. In contrast, the 90% was reached after 33 minutes and the load then became longer and longer, while the charger became very hot. On the other hand, the battery hardly heats up. For the next test, we did the charging in two stages, stopping at 50% and giving the charger time to cool down. In the end, the full charge took only 32 minutes, which is certainly higher than the 20 minutes announced, but is still an achievement compared to the 3 hours required for a conventional external battery of the same capacity. To test the discharge, we plugged the Apollo on a Samsung Galaxy S8 smartphone, which benefits from Quick Charge fast charge technology and uses a 3000 mAh battery. We have each time completely emptied the battery of the smartphone. The first test was to charge the Galaxy S8 in completely off mode. The 50% was reached in about 37 minutes, which is in line with the 30 minutes announced by Samsung for Quick Charge mode. On the other hand, the load slows down at the end of the course and it takes 25 minutes to go from 90 to 100%, against only 10 minutes to go from 80 to 90%. In the end, we fully recharged the Galaxy S8 in about 1 hour 35 minutes. We were expecting 50% capacity remaining on the Apollo (3000 mAh used on the 6000 mAh) and we got only 34%. This is due to the internal voltage of the battery, which is not 5 V but 3.7 V. In equivalent 5 V, the Apollo is a battery of 4440 mAh (6000 * 3.7 / 5 ). Using the same rule of three, the theoretical 50% becomes 37%, which is consistent with the result obtained. Therefore, it will only be possible to fully charge a smartphone with a 3000 mAh battery. The second discharge test is to charge the smartphone while continuing to use it. We use our versatile self-sufficiency test (surfing the web, viewing photos, playing videos). In the curve below, the battery is charged in 3 hours and remains at 100% for 1 hour before discharging, for a comfortable total autonomy of 14 hours 09 min, against 12 h 16 min when the Galaxy S8 is unloaded with his own battery. Again, beware of 6000 mAh announced because it does not imply that the autonomy will be doubled compared to 3000 mAh of the internal battery. Finally, we have fully loaded the Galaxy S8 with the device turned on, but off screen, as well as the Bluetooth and Wi-Fi interfaces. The results are close to the test with the device completely off. The full charge takes 1 hour 33 minutes and the battery is charged at 50% in about 37 minutes. In comparison, the full charge takes 1 h 36 minutes with the charger provided by Samsung and the 50% are reached after about 39 minutes. The only difference is in the temperature of the smartphone's battery, which reaches 35.8 degrees with the charger (around 70% charge) against 34.1 degrees with the Appolo battery. But again, the gaps are small. In short, the battery of Elecjet is equivalent to the charger provided by Samsung with its Galaxy S8.